From our Beaded Garland Collection of over 60 Beaded Garlands! 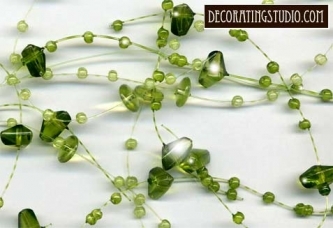 : A large range of shades of green are found in "Verde Green" Beaded Garland and create a stunning decoration. The mixture of beads and colors in this 5 foot beaded garland create a rich depth of color and design. You can cut this garland and the beads will not fall off. Perfect for table and centerpiece decorations for weddings, parties and event decor.